9-11 was the opening salvo on the Global Jihad on the West, a day of mourning our War Dead. We are the Gate-Keepers. History is not being taught. Freedom is a process. A war raging in the information Battle-Space. Working at an extreme disadvantage because of the media. The media is at war with the people. Siding with the very people who will eventually be their executioners. You must call out the media on their deceptions and lies. CHALLENGE. Part 2-Tommy Robinson of the English Defence League. These excerpts begin with Pamela Geller's intro for Robinson who describes how the EDL is taking the fight to the streets. Back to the enemy. Pamela Geller remembers the EDL from its formation. Three years ago...Police facilitated....knew they were going to assault the returning soldiers. First Tommy tried to be anonymous. false name. covered face. They exposed him a year later. It's become a blessing. Now he can say whatever needs to be said and people are following. They were called Racists. Nazis. Death threats against EDL by Muslims. Police said they couldn't protect the them. Told him to take his family and leave London. Then he stopped hiding. He's not running anymore from Islam's fear and intimidation. His is NOT a scared face. Muti-culturalism works. It's ISLAM that doesn't work. Islam doesn't integrate. We need to pin-point the exact problem which is Islamic Ideology. Their blue-print is inevitable. It's coming to a town near you. We can't keep running. It has to be stopped. I'm no angel, but I'm doing (this) for the right reasons. Standing up for what is right. Part 3: KEVIN Carroll, co-founder of the English Defence League and cousin to Tommy Robinson, spoke more about the beginnings of the EDL and elaborated on what motivates them...what should motivate us all as we fight for Democracy and against Islamization. British Police officers' Number One priority about terrorism is to dismantle the English Defence League. Incredible pressure. Trumped up charges. Try to demonize us. Call us cowards. Nazis. Media is corrupt. Biggest culprits. Cover-up. Spike stories. EDL has a political wing called British Freedom Party. One of the biggest stories in the last 3o years, was not in the press once. A main stream political party being formed. Press doesn't want public to know there is a political party they can vote for. We are NOT racists. We're just No Longer Silent. Attacks constant on Christianity and Judaism. It's now illegal to wear the Sign of the Cross at work. If you refuse to remove it you can be arrested. The Media. Leftist. Yellow. Apologists. The EDL is made up of Patriots. To be a Patriot is not to be a racist. We need strong, patriotic leaders who love their country. Love their people. Love their Nation. Democracy. Freedom of Speech. Obama. Cameron were traitors. Sold out their country. Kevin ended with, "I'd rather die on my feet, than live on my knees." 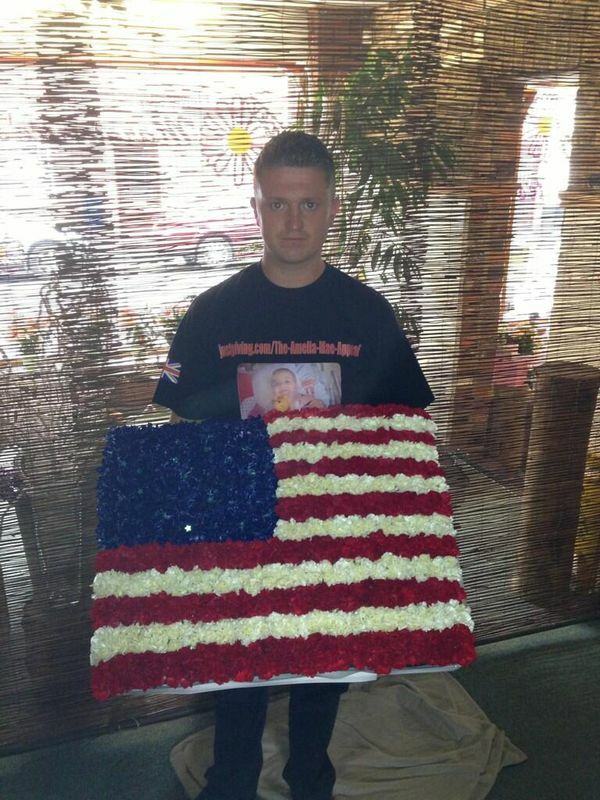 Tommy can be seen below holding the flowers that Pamela and Robert had ordered for the occasion, a memorial walk in honor of murdered British soldier and drummer, Lee Rigby. Pamela stressed, " Despite all the disinformation in the media, we were not marching or protesting. We were going to the UK to lay flowers at the site of the jihad beheading of drummer Lee Rigby. That is all." And watch Tommy and Kevin as they are harassed....set-up by two Marxist stooges, resulting in Tommy and Kevin's arrest.... not the arrest of the tools who assaulted them. Lots more to read in the comments section posted at Atlas Shrugs. Updated regarding these two guys were attacked by the red commies Purssell and Cole just seconds before the female police officer told T&K they were being arrested. Bottom Line: We Must FIGHT BACK with the TRUTH! For more useful materials in the information battle, Go here..
July 1, 2013: There's MORE. An UPDATE from Pamela Geller on their CHALLENGE. Sign the Petition!